The Berlin Wall is perhaps the most famous human artefact in modern world history. Built in 1961 at the height of the Cold War, the Wall symbolised in physical form the ideological and political divide between the Western Bloc and the USSR. 15 years after Winston Churchill’s Iron Curtain speech in Fulton, Missouri, a monolithic and impenetrable barrier that cut across Europe became a reality, situating the city of Berlin at the fulcrum of Cold War antagonisms. In the early hours of August 13th, 1961, ‘shock workers’ from the GDR and Russia shut off the border between the Soviet and Western sectors of Berlin with barbed wire. Three days later, the barbed wire was removed and replaced with a solid wall of concrete. Before long, West Berlin was surrounded by a wall 100 miles long and nearly 12ft high. Over time, the Wall was reinforced and rebuilt through a process of fortiﬁcation. Immediately beyond the Wall, on East German territory, was a piece of land known as the ‘death strip’, where guards would patrol the border and shoot down anyone attempting to cross. In total, 136 people were killed trying to cross from East to West Berlin. 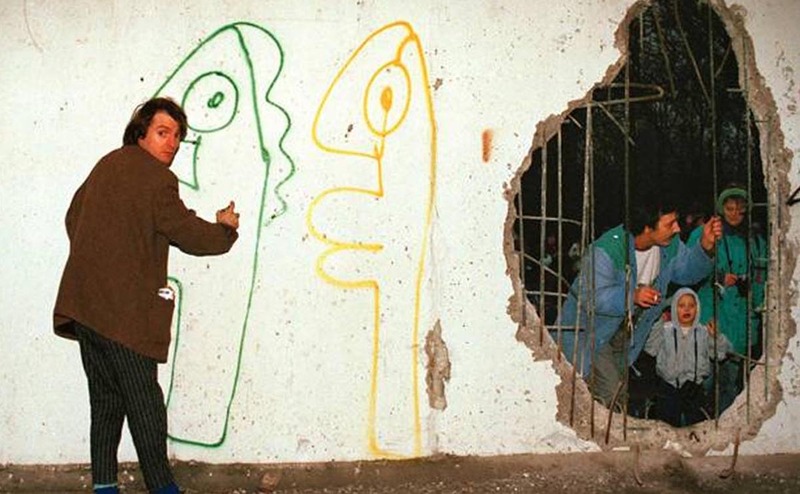 In 1984,Thierry Noir became the ﬁrst artist to illegally paint miles of the Berlin Wall. 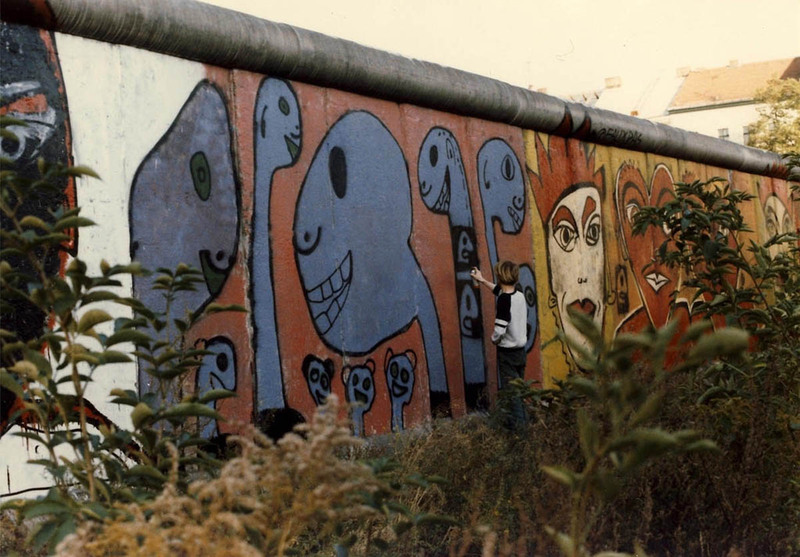 This revolutionary act inspired other artists, and over the next ﬁve years the Wall was covered with layers of artwork and images, creating a ‘palimpsest of protest’. As Noir says, painting the Wall made him feel stronger than it. For years, the Wall had stood as an oppressive symbol of a divided world, materialising a history of separation and struggle. Noir’s work subverted this iconic symbol of war into a symbol of hope, granting it a real human signiﬁcance. In 1989, the Wall fell, marking the end of the Cold War. 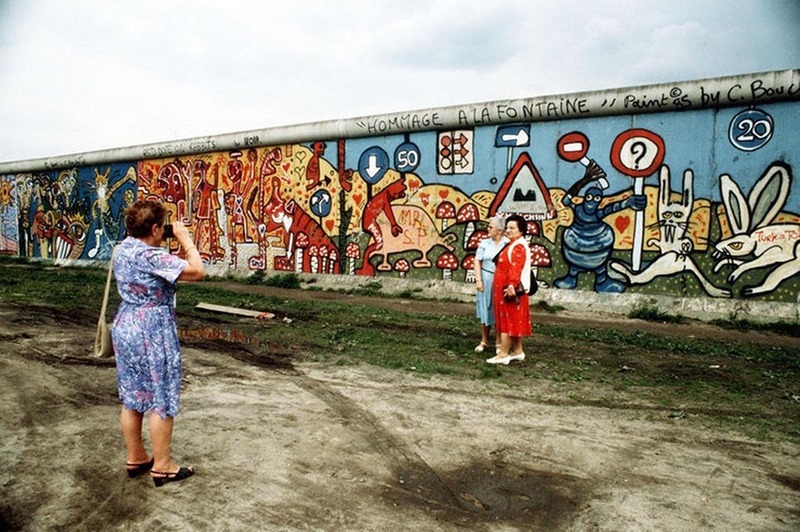 Sections of the Wall, such as those at Potsdamer Platz, on Bernauer Strasse and on Muhlenstrass were deliberately left as a lasting memorial: the East Side Gallery. 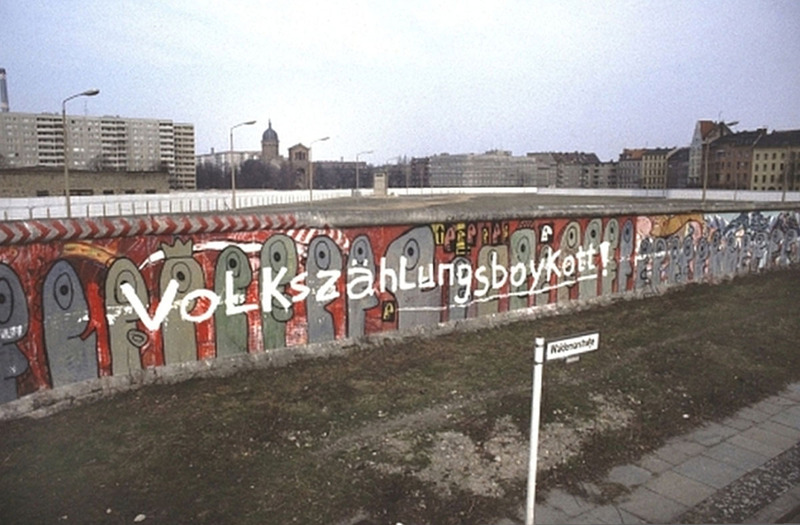 Many artists, including Noir, were invited to paint the Eastern face of these Wall fragments as a visual enactment of reuniﬁcation. Noir’s work remains on these fragments and many others all over the world as a poignant political statement to change and the hope of a better future. 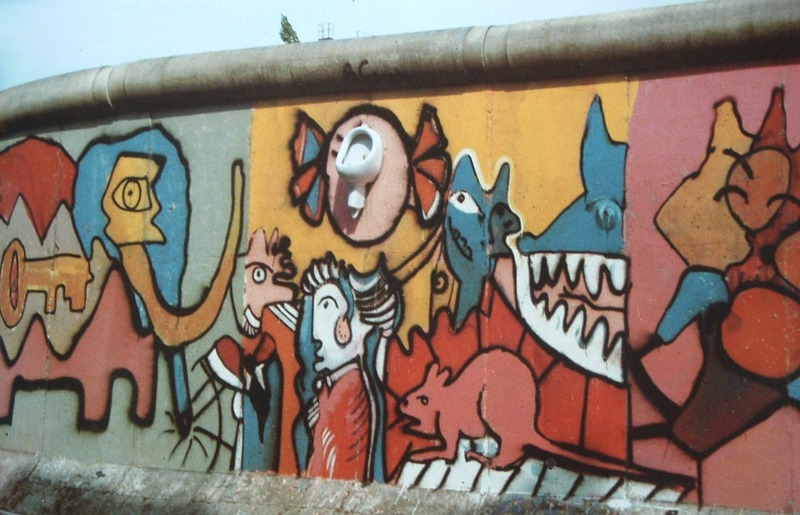 Many have called the Berlin Wall one of the greatest public artworks of the 20th century. 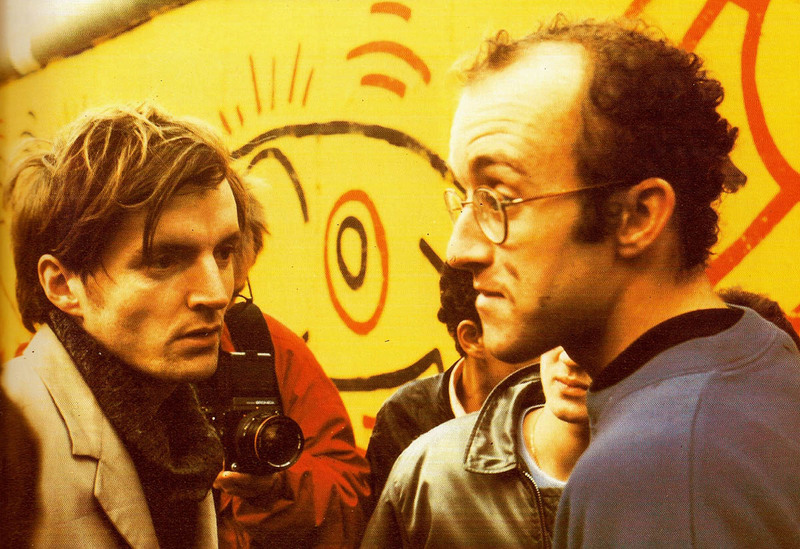 More than any other individual, Thierry Noir left a lasting testament to the power of artistic protest in the name of freedom.